Data management applications, by which I mean an app where you’re allowing users to add, edit, and delete bits of data as part of your app’s core function, very likely use a table view (or two) to visualize lists of information that users of the app can interact with. Making changes to the information listed in the table view and signaling those changes in a fluent way becomes a top concern for these types of apps. How do we allow users to add or remove “records” to the system? Furthermore, how do we signal that those changes were effective and refresh the view of the data in the UI? 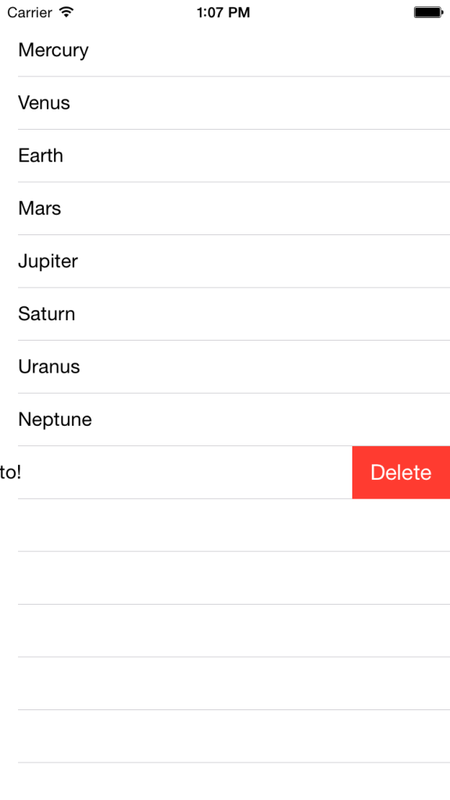 Swipe a table view row and have the Delete button appear. Based on the user’s response to the confirmation, delete the object from the data source and remove it from the table view, or cancel. The confirmation step is atypical for iOS it seems. Swiping to delete an e-mail or a reminder or just about anything else in Apple’s own apps simply deletes the item right away. There may be a good reason for this, but I like to give folks an out if they didn’t mean to do it. It’s fair enough to say, “Well, they went to the effort of swiping the row and pressing the button… surely they mean to do it!”. I still feel more comfortable if I get the opportunity to cancel something like a delete operation. Feel free to disagree there – for this article, I’ll assume you want to include that into your delete workflow, and will demonstrate a simple way to implement all three steps of the strategy. To accomplish this, we need to do a couple of things. So what’s happening here? The primary thing to notice is that we’re evaluating the editingStyle from the method’s parameter list. Comparing it to the .Delete UITableViewCellEditingStyle value is what allows us to know that the Delete button was tapped. Since I have a confirmation step to take care of, I’ve chosen to store the indexPath of the row we’re wanting to delete in a class-viewable variable so that I can use it later on when we handle the deletion (if the user confirms it). 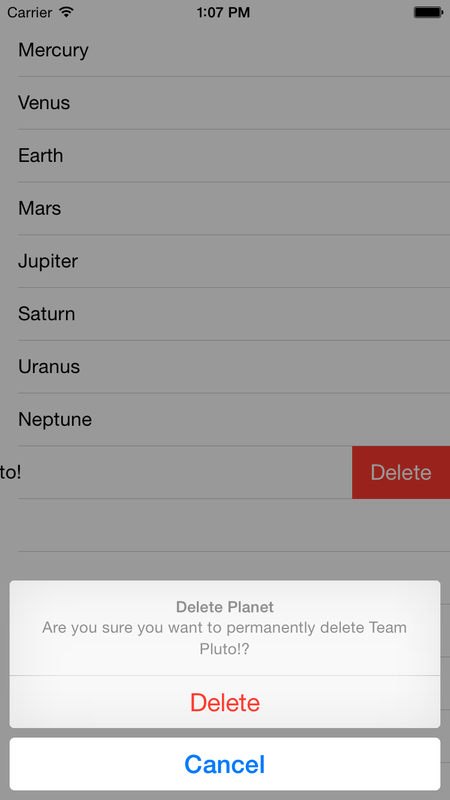 We’re asking the user if they’re sure they want to permanently delete the planet using the .ActionSheet style. The next step of the function is to create a couple of UIAlertAction buttons: one for Delete and one for Cancel, with the appropriate style (.Destructive and .Cancel, respectively). Finally, we provide a function to each UIAlertAction instance. The handlers, of course, could have been implemented with closures, but I chose to built out a couple of named functions, just to be able to step through it with you, and to separate out the logic of the steps a little more. Feel free to do whichever seems most natural to you. Call beginUpdates() on the table view instance to signal the start of UI updates to the table view. Remove the planet from the data source using the deletePlanetIndexPath we set in the alert controller step. 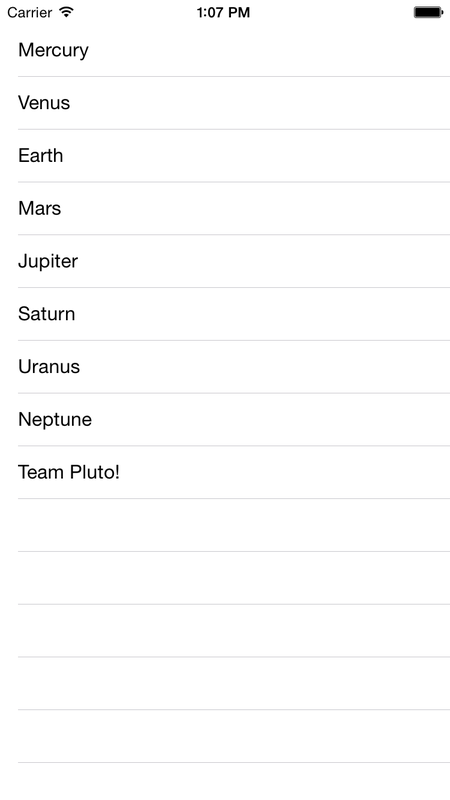 Call deleteRowsAtIndexPaths() on the table view to remove the planet from the UI. Reset the class-viewable deletePlanetIndexPath to nil. Call endUpdates() on the table view instance to complete the UI updates. There’s one gotcha, that I’ve tried to highlight by way of comment in the code snippet: Notice that within the call to deleteRowsAtIndexPaths (plural), I’ve wrapped the indexPath we’re removing in an array. It’s subtle, but this delegate method expects an array of indexPath instances, not a single index path instance. It’s simple enough, but it can catch you off guard if you’re in the mindset of removing a single row and come across this method, which is flexible enough to allow you to delete several at a time. Swipe -> confirm -> delete or cancel. Those are the steps we analyzed in this commonly needed workflow in data management applications.